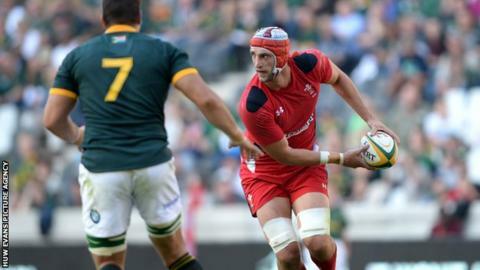 Lock Luke Charteris does not know why Wales have fallen short against southern hemisphere sides including Saturday's opponents South Africa. Wales were leading Australia and New Zealand during the autumn but lost both games. They were denied a first Test win in South Africa as the Boks snatched a dramatic victory in June. "To put ourselves in that position isn't really good enough," Charteris said. "We have to put ourselves in that position and win the games as well." Wales' loss to world champions New Zealand was their 26th in 27 games against the All Blacks, Australia and South Africa since Warren Gatland took charge. In the summer they were beaten 31-30 by South Africa after a converted late penalty try in a game they had not been behind in until two minutes from time. Charteris, who was yellow carded in the second Test in Nelspruit, is unsure why Wales keep coming up short against the southern hemisphere sides. "It's frustrating and one of those things it's hard to put a finger on," Charteris added. Wales v South Africa: Gatland under pressure? Next question! "We certainly feel we're in the games and it's not a psychological barrier. I don't know what it is to be honest with you it's quite a hard thing to answer. "The more we're playing these teams and the more we're exposed to that hopefully the better we react when that situation comes around." Scarlets lock Jake Ball kept Racing Metro's Charteris out of Wales' starting XV against New Zealand last Saturday. Charteris missed Wales' opening Test of the autumn against Australia because of club commitments but is available to face the Springboks and welcomes the competition for places. "We've always had good strength in depth in the second row," he said. "Whether it was Ian [Evans], Brad [Bradley Davies], myself or Alun [Wyn Jones]. Now Jake's come in as well and it's excellent. "What we're trying to build throughout the whole squad is that competition going forward." Charteris and Wales' French-based players are available to face South Africa, but only George North of the England-based group is with the squad. North is being assessed for concussion to see if he can play against South Africa and Gatland has delayed naming his side until Thursday. But Charteris insists Wales will be ready for the South African challenge despite a punishing autumn schedule. "These autumn campaigns are tough because you get four weeks on the bounce without a break like the Six Nations," he said. "But with the size of the squad and the depth we've managed to rotate it a little bit and still got most of the squad here left with us."